I started this post while I was sick with an awful chest cold. It was so bad that I had to pull out of USAT Duathlon Nationals– so much for a trip to the World Championship in Spain next year! But that also means I had a few moments to focus on blog posts– and, in this case, product reviews. While I’m always tinkering with lots of different products and ideas, not many of them actually “stick” and really show promise. The ones that don’t make the cut rarely get a word from me and only a few of the promising ones get a review. This is one of those few products. NOTICE: Please be advised that, if you’re a male between the ages of 48 and 59, do not read past this paragraph. Nothing here will help you. Instead, I urge you to try this amazing sports supplement— just use it and you won’t have to worry about running, cycling, or recovery times. With this product, more is always better. Trust me. Okay, assuming you’re still reading and you are not in my age group, then the Firefly will likely be something you may want to add to your sports recovery regime. It’s easy-to-use and devastatingly effective. How effective is it? Well, I used a pair for eleven days before I caught the Mother of All Colds. This table summarizes my results. 1 After a short, tough running workout, used the Firefly for 2 hours. Use the Firefly late (about two hours after exercise) and then went to dinner and a ballet performance in the evening. 2 Performed a short FTP test on the bike and results were the same as my last FTP test. My legs were tired but had plenty of energy. Very strange. Afterwards, used Firefly for 2 hours immediately after workout. 3 Cycling group class. Rode the Sufferfest Downward Spiral workout and crushed it. This was a surprise given that the rest of the class barely hung on. Used Firefly for 2 hours immediately after workout. 4 Usually this is a rest day for me but I wanted to test out my cycling recovery with the Firefly so I rode another FTP test while riding in Zwift. I started a little slow with heavy legs but then was able to push really hard. FTP results were more than a few watts above my last FTP test. I did manage to also grab the polka jersey for “Epic KOM” in Zwift! Did not use Firefly after workout. 5 Steady ride in the morning. This workout was much harder than usual and my legs had no “pop”. Then boarded a flight to San Diego. Used the Firefly plus compression stockings for 2 hours before and at the beginning of the flights and then for an additional hour near end of flight. 6 Fast set of mile repeats in San Diego. I usually don’t do speedwork while on travel but it was sunny and gorgeous– and I didn’t have a ton of time. Pace was good and legs felt fine. But my body was dead tired so the pace wasn’t quite as fast as usual. Immediately after run, used Firefly for 2 hours with compression while at dinner. Then used Firefly for a third hour before going to bed. 7 Busy day working in San Diego and couldn’t work out. Flew back to Seattle. Did not use Firefly on flight. 8 Felt physically and mentally exhausted after trip. Rode an hour but ride was definitely below average. Used Firefly for two hours immediately after ride. 9 Rode an hour on the bike but still dragging. Used Firefly for 2 hours after ride. 10 Long hard cycling workout with group (Sufferfest “It Seemed Like a Good Idea at the Time”). Performed really well even though it was a killer workout. Immediately off the bike, ran 5 miles at a reasonable pace with a mile and a half near race pace at the end. Overall, a fantastic workout given how tired I was from that conference. Used Firefly for two hours after workout. 11 Again, this is normally an off-day for me but I instead I rode moderately hard for 90 minutes on the bike and performed another FTP test. Same results as before. Used Firefly for two hours following workout. 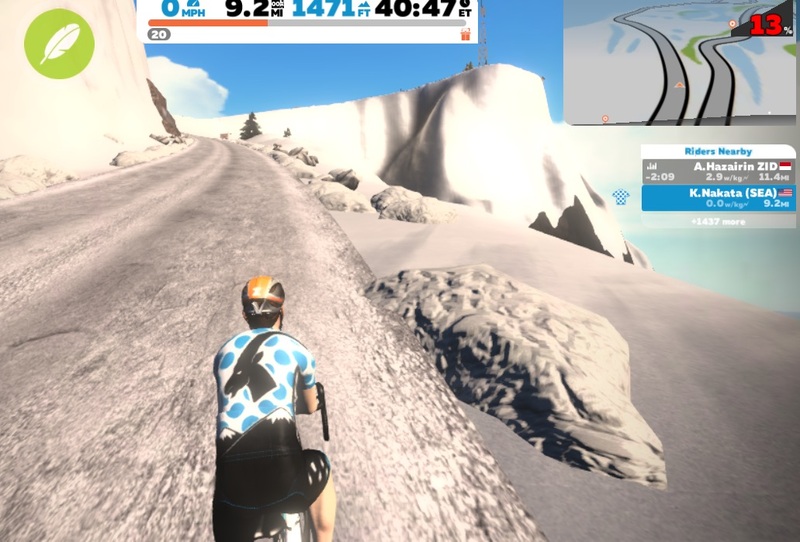 On the left is a screenshot of my avatar proudly wearing the blue polka dot “Epic KOM” jersey in Zwift on Day 4. I had never done that before! Granted, my glory only lasted about two hours before someone else took it from me, but I was still pretty happy with the effort. The Firefly definitely helps my legs recover and enables me to push much harder day after day. It work best when I used it immediately after a workout and with my feet up. Used later or during other activities (e.g. walking around) is helpful– just not to the same degree. If I had to quantify it, I’d say that really dedicating time to relaxing with the Firefly is about 25-50% more effective than not. While the Firefly works great (particularly with your legs), other good recovery strategies are important. This includes the obvious things like good nutrition and sleep but it also includes mobility work and time working on adhesions and scar tissue (e.g. foam rolling). While I have heard that the Firefly helps your entire body recover, I can only attest to its effects for me on the legs and lower body as I’m a duathlete. The Firefly is definitely indispensable, however, after really hard workouts as I could workout like a 20 year old after a hard workout. I could do a hard workout and turn right around and do it again. Simply amazing. The Firefly is an electrical stimulation device. Great, you might be thinking, it’s just another electrical muscle stimulator like the Compex. And yes, I’ve reviewed that device before and think its great. But the Firefly is different from the Compex for a number of reasons. It’s Cheap and Disposable. Electrical Muscle Stimulator (EMS) devices are not cheap. A good Compex will run you around $500. The new kid of the block– the wireless iPhone controlled PowerDot— will also set you back about the same amount of money. Once you own one, the ongoing costs are really the gel pads, which run about $20-$25 a set (unless you rewire your Compex cables to use cheaper pads). By contrast, a Firefly costs about $25-$30 soup to nuts. It’s a completely self-contained device that you throw away when you’re done. The internal battery is good for between 24 hours (guaranteed) up to 30 hours, depending on usage. As the table above shows, I’ve currently used my Firefly for about 20 hours and it is still going fine. So assuming you use one as much as I do, you may go through two a month? Compared to the Compex, that’s almost the same cost as two sets of pads, which you would certainly go through in a month anyways. While I’ve talked to them about my desire for a non-disposable version, the folks at Firefly mentioned that the device originated in the medical world where disposable technologies are the norm. In that world, it is called the Geko and it it is used as a post-surgical device to speed recovery and prevent thromboembolisms. It’s Not Really an EMS Device. An EMS device is applied to directly to the skin above a muscle group. Ideally, you want to target the so-called “motor points” in the muscle. By contrast, the Firefly is wraps around the back of the calf and stimulates the peroneal nerve, which conveniently runs close to the surface at that location. This is highly convenient because stimulating the peroneal nerve has the advantage of stimulating several muscles farther down the leg. With all this said, I found that the Firefly feels a lot like the Compex Recovery Program with its regular “pulses” or “twitches.” I can’t say for sure that a Compex used for 2 hours is any better or worse than a Firefly used for the same time period– all I know is that the Firefly is really effective. Plus, the Compex requires being hooked up to mass of cables while the Firefly is just a single tiny strap behind the knee. Get the Starter Pack. If you go to the Firefly Shop, you can buy a pair of Firefly’s for $35. I wouldn’t recommend that, however, and would suggest that you go with the $75 Starter Pack because the knee straps that come with the starter pack are pretty essential. I’ve found that you can (and probably should) leave the knee straps at home if you are using the Firefly’s with compressions leggings or tights– but any other time, the knee straps are absolutely required. 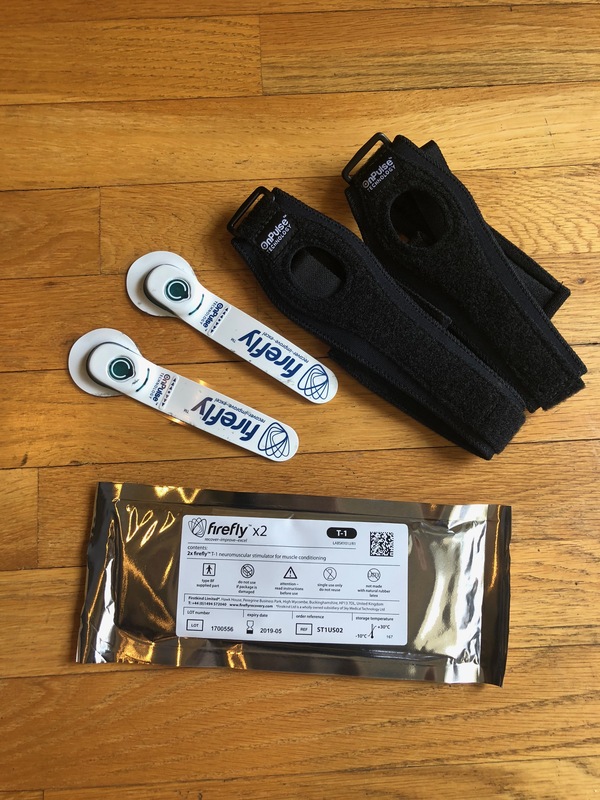 The photo on the right shows what’s included in the Starter Pack– two pairs of Firefly devices (one pair is still unopened in the silver mylar package at the bottom) and a pair of knee straps. Use Them As Soon as Possible. The folks at Firefly recommend using the device within an hour of ending your workout– and I completely agree. I’ve had my best workouts the day after remembering to use the Firefly early. I can’t emphasize this point enough. Your Upper Legs May Still be Tired But They are Still Recovering. The Firefly definitely makes your lower legs feel great through the electric pulses that they provide. Your hamstrings and quadriceps, however, don’t get any stimulation. At first, I thought this would be a major limitation of the Firefly for me, because the quadriceps and hamstrings play such a major role in running and cycling. But, while my thigh muscles did feel tired the next day, they were definitely recovered as I was able to still smash out workouts. All they needed was a good warmup and they were good to go. Try to Raise Your Legs and Roll Them Out. If you can raise your legs while using the Firefly and roll out your quads and hamstrings, that would be ideal. The new and improved Roll Recovery R8 is simply fantastic when paired with a Firefly. The combination is simply nirvana. For me, using the Firefly this way for just an hour easily beats using one for two or more hours standing up or even sitting. Don’t Forget Your Regular Recovery Regime. The Firefly is fantastic but it shouldn’t replace the rest of your recovery regime. Of course, there’s nutrition but also more physical strategies such as foam rolling need to continue. In a future post, I’ll talk about my current recovery routine. Use Them on Travel. The Firefly is sold as a device that works particularly well at improving blood flow during long periods of inactivity, such as when traveling on long-haul flights. That’s probably true but I feel soooooo crappy after long flights that I can’t say whether anything is going to make me feel great after enduring them. Nevertheless, my experience from a reasonable 3-hour flight to and from San Diego suggest that they work well at helping you recover. How Do You Use the Firefly? The Firefly site includes lots of helpful information and videos for using it. Also, inside the silver mylar package (in the photo above) are detailed instructions, which I’ve included in this review. In a nutshell, however, it simply involves following these steps. Clean the skin below and behind your knee. Feeling down the outside of your leg just below your knee joint, you should feel a sharp bony protuberance. This is your fibula head. You just have to peel the firefly off the clear plastic backing and place the line of blue triangles on top of the fibula head, with the big circle to the front and the tail to the rear. Once it is attached, it should look just like the photo on the right. Now you can optionally put on the knee straps to hold them in place– or just your compression tights on top. Once you have it in place, press the blue button in the circle. A long push turns the Firefly on or off. Short pushes rotates the device through seven progressively intense settings. I’ve never used the Firefly for more than two hours at a stretch– and frankly I think that one hour gives at least 75% of the benefits that a two-hour session provides. Personally, I would still prefer to use the Firefly for two hours after a really hard workout as the remaining 25% of recovery will make a very tangible difference. The folks at Firefly recommend using Firefly for two hours on an easy day and four hours on a hard days (although their worldwide site recommends longer usage). At $35 for about 30 hours of use, that gets pretty expensive– if you work out hard every other day, you would use a Firefly for three hours on average– so a pair would last about 10 days, which means about $105 per month. Not terribly expensive if that was the only thing you were doing for recovery but a big price if it is just one part of a multi-part recovery plan! If I were on a multi-day bike tour or at a training camp, this would be a no-brainer but it’s a bit intense of a routine (and a big hit on the wallet) for everyday use. As I’ve said, I think that an hour provides a huge benefit– particularly if you can build in the time to do it with your feet up and while using an R8 roller. Since I wrote the timetable above, I’ve used it this way after some devastatingly hard workouts with great results. I think there are a couple of different ways you can stretch out your Firefly usage to save some money. Let’s say you work out hard every other day. If you use the Firefly for an hour on easy days and two hours on hard days, that would add up to about 45 hours a month– or about 1.5 Firefly’s a month. That comes out to about $50 a month– and frankly that’s probably the best option. If your budget is a little more lean, you could just use it for two hours a day after your hard workouts (and skip the easy days). This adds up to about 30 hours a month (one Firefly) and you’ll have to spend about $35 a month. This is also a sound option. Let’s say your recovery routine is pretty good or you’re in a phase of your training where your hard workouts aren’t that hard. Then you could get by with just an hour after your hard workouts. Then you’re looking at about 15 hours a month and you could potentially stretch your $35 investment for almost two months. I wouldn’t do that, however, because my hard workouts are never this forgiving. I’ve talked to the kind folks at Firefly and they are happy to offer our readers a 10% discount on all products (except the “Starter Pack” as it is already discounted). Just use the code “FIREFLYATM”. You’ll be recovering faster and you’ll be helping the Athletic Time Machine bring you more helpful tips to help your training and racing. I know that I will be using that code personally to buy my replacement Firefly units in the future! Disclaimer: The Athletic Time Machine is not affiliated with OnPulse Technology, the creator of the Firefly. The review unit was provided free of charge by OnPulse Technology. The Athletic Time Machine was neither asked nor obliged to provide this review. Postscript: After I wrote this post, I kept using my Firefly and had the same results– I was surprisingly powerful the day after each time I used it. I’m still experimenting with the perfect balance of usage (e.g. two hours after every hard workout versus one hour each day) and the right way to use it (e.g. feet raised against the wall versus level on the couch). In total, I managed to get a little over 32 hours out of my first Firefly. This is definitely a product that I will be using a lot in the future.